Knitting is craftmanship. A profession which you have to start at a young age and what, after a lot of kilometers of knitting, only gives a good thread tension. As a knit of every level you can enjoy your knitting and come to one of the tables to go to work yourself. The best knitters walk around that week to help or advise. All you need to bring are your knitting needles (3 mm), we provide pattern, material and a lesson with handouts and a cup of coffee + simple breakfast. Always place for new participants who also want to experience what knitting is now. 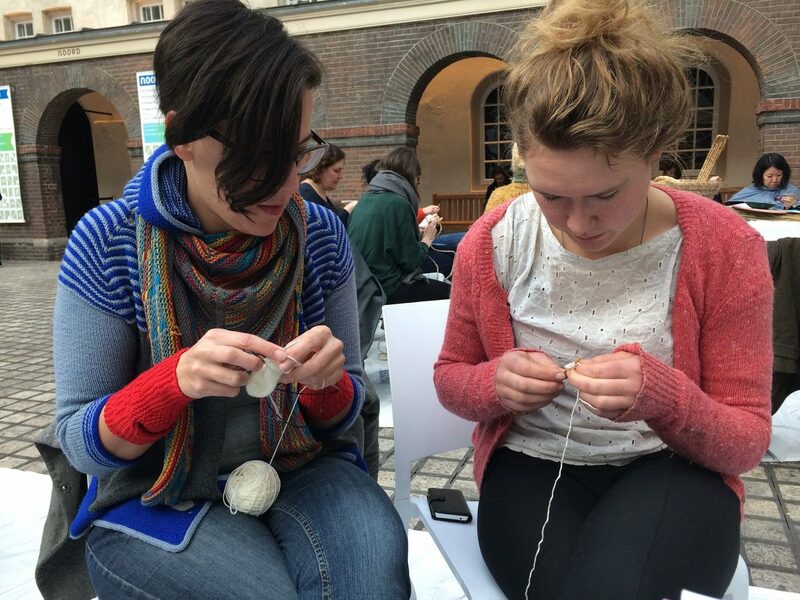 14:30-17:30; Knitting 16 ways of tricot. An investigation into the anatomy of the knitting stitch. If you really want to understand what a knitting stitch does and want to study THREE hours in 1 stitch, this is the program for you. Please bring; knitting needles 3 mm. Price; 35, – including material and handout. 12:00-14:00; lesson 1 Knitting Haute Couture (max 6 participants). Knit a cardigan in your own size. This program runs over 5 mornings. If you want to participate, please attend all five lessons. 14:00-16:00; How can the work of Joep van Lieshout inspire knitters? Our knitting academy is surrounded the special work of Atelier van Lieshout. Please bring; camera, pen and paper, sketchpad, needle 3 mm. How can the Pythagorean theorem help you to calculate the angles of inclination of your knitted scarf? Please bring; 2 sets of knitting needles 3 mm + circular needle (60 or 80 cm) of 3 mm, calculator, triangular, graph paper and pencil. 12.00-18.00; Making a mini-booklet of fibers and materials. A real “in depth” material research. While you get information about the different materials and fibers for handknitting, you’ll knit a mini sample book with your favorite materials to always carry in your bag and use it in the store when choosing new clothes. While Maartje takes you through the knitting of the samples, Froukje is ready to teach you how to spin so that you can make a sample of unusual and not yet existing combinations. Please bring: if you have a spinning roll, camera, knitting needles 3,5 and 4 mm, from your own stock 2 or 3 balls of yarn in white / undyed color. Price; 45, – Includes: materials and handouts. 15:00-16:00; Breiacademie for children of all ages. 14.00-18.00; Open workshop and first aid for breion successes. Especially intended for young designers who want to use hand knitting in their collection. During this workshop we will connect you with well-trained hand knitters with a lot of knowledge. We go to work one-on-one during this workshop with your specific questions. Please bring; own preparation and questions. 12:00-14:00; Knitting lessons for beginners, or for knitters who want to learn to pick stitches from knitwear. You have to be able to set up, cut off and knit right. Please bring; Knitting needles 3,3 or 4 mm. 16:00-17:00; Knitting Academy for children of all ages. 10:00-17:00 Open workshop for designers who want to include hand knitting in their collection.